I recently had the privilege of reviewing B&H Academic's Taking Christian Moral Thought Seriously. It might surprise some to know that I don't have my position on ethics entirely lined up (you can read my review of IVP's Beyond Bumper Sticker Ethics: An Introduction to Theories of Right and Wrong). I've spent time in well defined camps and felt at odds with things here or there. One of the major reasons I feel this way is because I'm still in the process of nailing down certain philosophical positions (in particular the effects and presumptions of individualism) that I see the Scriptures addressing at best loosely. In light of this confession, I need to pour some more glory and recognition on the amazing article "Reframing the Abortion Question" written by James Noland. Coming near the conclusion of Taking Christian Moral Thought Seriously it brought a stirring of many thoughts concerning incorrect assumption about individualism. I do not want to dig too deep here for fear that you won't buy the book. Let me simply state, Noland's essays are worth the price of the book in my opinion (for those local readers you should borrow it from my library). Both discussion assumptions stemming from the Enlightenment that have gone unquestioned for too long. To peak your interest, let me walk through a portion of what I found wonderful about Noland's second essay. Noland goes on to describe how teleology is absent from this understanding of personhood and why this lack of telos ultimately explains why non-Christians are unmoved by arguments from Psalm 139 and Jeremiah 1. Because I want to preserve the content of the essay, I'll have to stop short of how Noland details we think about personhood. However, I will state briefly that Noland's perspective provides fascinating benefits for discussions on adoption and infant baptism. 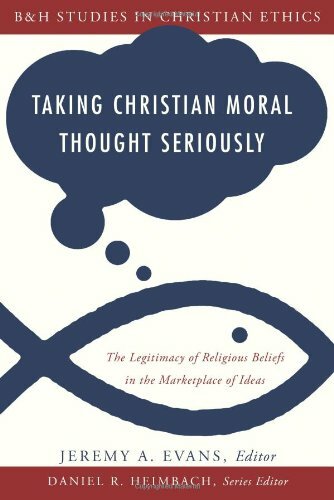 For those seeking a thought provoking read that goes counter the current arguments I highly recommend Taking Christian Moral Thought Seriously.